Ever hear a piece of really juicy gossip? A man cheated on his wife? A business-man caught for financial wrongdoing? Or some other nonsensical tidbit of embarrassing or deprecatory trivia? Well, according to the Kli Yakar, there is a high likelihood that the purveyors of such gossip are themselves guilty of the very same crimes they are so eager to point out. According to the Kli Yakar the gossiper is like a fly. 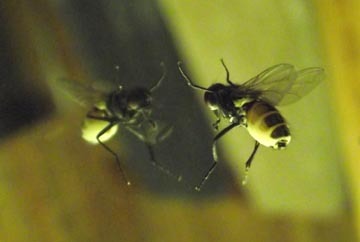 A fly will scour the entire body of a person. The fly will inspect every inch of flesh and ignore the strong, whole, healthy skin. The fly will zoom in on any bit of exposed, unhealthy, putrid flesh. The fly will feast on the diseased part of the person. The Kli Yakar adds an additional point. Such flies, such gossipers, are not only attracted to the bad in every person. They are attracted to those faults, those problems that mirror their own. They assume that others have the same faults and issues as they do and will gleefully point out that very fault in others. So the next time that gossiper reveals the problems of others, take a step back, and consider whether it is a confession on their part instead. May we keep our ears and mouths closed to gossip. We might catch a fly. To the memory of my dear, great-uncle David Spitz of Forest Hills, NY, who passed away this week. A great man who encompassed multiple traits, including generosity, kindness and a quick sense of humor. He survived the Holocaust and went on to thrive, building a family and seeing not only grandchildren, but many, many great-grandchildren as well. We will miss Uncle Dave.